Rather than watch games from the sideline, Claeys prefers to observe from the press box – and always has. Grinch, WSU’s DC from 2015-17, spent one year coordinating from the booth before moving to the field early in the 2016 season. 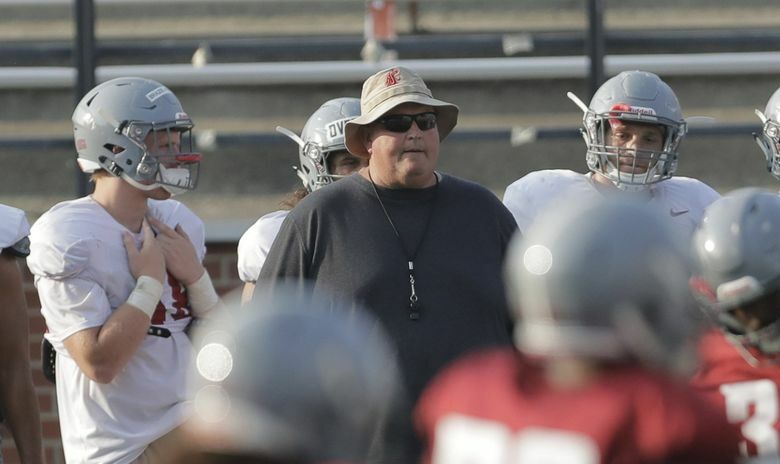 PULLMAN – Tracy Claeys vowed not to make wholesale changes to Washington State’s defense when he was hired as Mike Leach’s new defensive coordinator in January. Eight months later, WSU’s identity on that side of the ball doesn’t look much different than it did a year ago and neither are the numbers the defense has churned out through two games. The Cougars, albeit having only seen two pedestrian Mountain West offenses to this point – Wyoming and San Jose State – rank third nationally in yards allowed per game (143.5), fifth in passing yards allowed (91 ypg) and tied for 13th in scoring defense (9.5 ppg allowed). WSU’s “Speed D” mantra has outlasted the defensive coordinator who coined it and Claeys has made an effort to retain the verbiage and terminology used under his predecessor, Alex Grinch, hoping it will eliminate confusion and reduce the learning curve that would typically come with a DC change. While Claeys has left most things untouched, there has been one changeup. Rather than watch games from the sideline, Claeys prefers to observe from the press box – and always has. Grinch, WSU’s DC from 2015-17, spent one year coordinating from the booth before moving to the field early in the 2016 season. He remained there through the end of the 2017 season before accepting a position at Ohio State. Claeys is more on the soft-spoken side and prefers to relay his coaching lessons to the position coaches in meeting rooms, then allow them to instruct players in practices and games. Unlike Grinch, who doubled as the Cougars’ secondary coach, Claeys also isn’t tied to a singular position group. When the NCAA passed legislation allowing teams to hire a 10th assistant coach, the Cougars reworked their defensive staff and promoted Darcel McBath to coach cornerbacks. Now WSU has a single coach designated to each unit: defensive line, inside linebackers, outside linebackers, safeties and cornerbacks. Additionally, Claeys thinks coaches tend to get wrapped up in the excitement and emotion of the game when they’re on the sideline. The booth provides a calmer atmosphere that can be more conducive for a coach as he’s processing everything that’s happening in a game. Having a DC in the box versus having him on the sideline doesn’t seem to make a difference for players, who’ve always communicated with their position coaches on the sideline.